On Saturday 27th. Probably still in a pub outside Croke Park with Finbarr, before the All Ireland hurling final between Kilkenny and Tipp. Very fast, skilful, game, but the winner, I think, was as usual Diageo. On Sunday 28th. Coming off Crohane above L.Guitane in Kerry, to scramble over the spectacular wee peak of Binnaunmore and back to the car. The route we got lost on with Keith and Sandra- but fortunately I had no MLs navigating this time, just Finbarr ( who thought he was in Mayo). On Monday 29th. 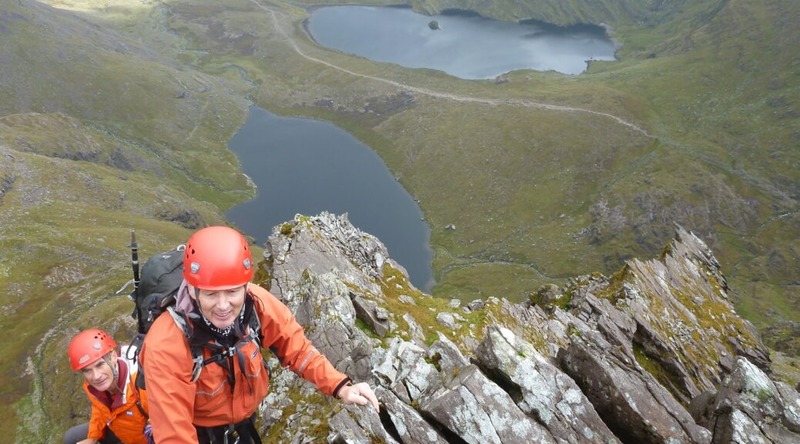 Having done the Eastern Reeks in mist and drizzle ( the Cruach Mor/ Big Gun/Cnoc na Peasta section is great, even when viewless, wet and slippery) we met local guide Pearse Kelly with a client from Derry descending the zig zags. On Tuesday 30th. On top of Torc mountain, with views clearing on all sides, after a wet morning. On Wednesday 30th. On the Beenkeeragh Ridge in glorious sunshine, having soloed Howling Ridge with Finbarr and Jack Bergin in wet, but improving, conditions. On Thursday 1st Oct. Having coffee with Valli in Collooney on the way home ( thats more sensible).